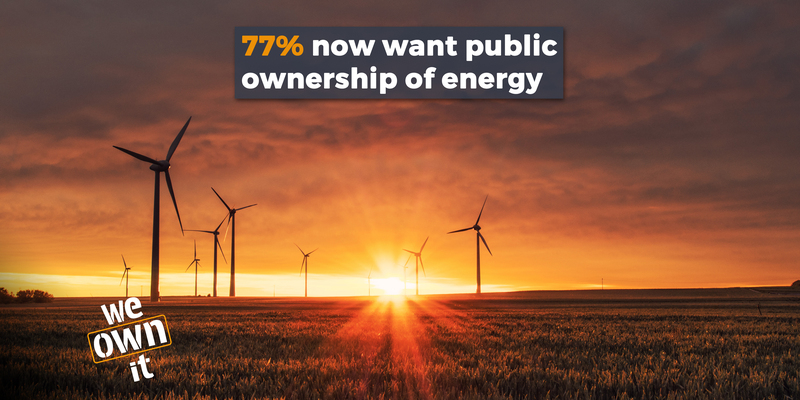 77% of us believe energy should be in public ownership but our energy system is mostly private. National Grid - which is responsible for transmission and distribution - is a private company. British Gas was floated on the stock market in 1986, accompanied by the famous ‘Tell Sid’ advertising campaign. In 1990, the UK’s regional electricity boards were privatised. The Big Six energy companies (British Gas, E.ON, EDF Energy, nPower, Scottish Energy and SSE) supply 95% of all UK households with electricity and gas. Tell Sid: it's a rip off! Right now only 10.2% of the UK's energy comes from renewable sources - we're lagging behind with investment. The real prices of gas and electricity have increased by 13% and 67% respectively since the year 2000. Studies examining the UK energy market have concluded that electricity prices are 10-20% higher than they would have been without privatisation. Corporate Watch research suggests each UK household could save £158 a year if energy was publicly owned. Over 10% of English households live in fuel poverty. Right now, regional private energy distribution companies are making it too slow and costly for communities to start up new renewable energy projects. We need to buy back the National Grid and regional distribution companies so that we can control this natural monopoly. National Grid should be publicly owned so that we can create the clean, green, decentralised energy future we need. Buying back energy distribution would pay for itself in around 10 years. Alternatives to the Big Six: switch to public energy today! The Big Six don't answer to you and me, they answer to their shareholders. Customer satisfaction with the Big Six companies is low, and only 32% of the public trust the energy industry. New, inspiring, publicly owned alternatives are springing up, like Bristol Energy, Robin Hood Energy, The People's Energy Company and White Rose Energy. In Germany, public, council owned energy companies supply around half of the market. Communities around the world are bringing energy into public ownership for lower bills, more renewable energy, and to combat corporate power. 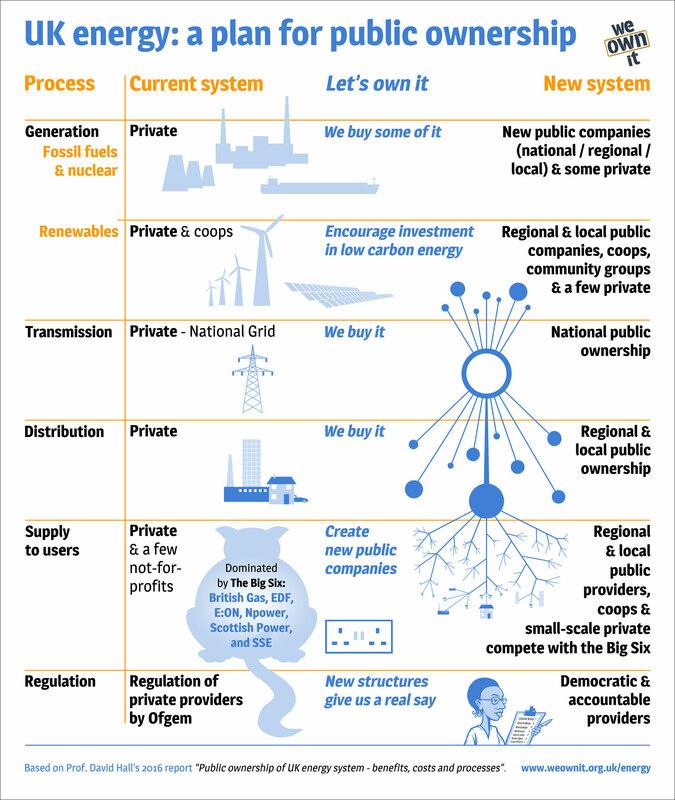 Public ownership of energy often paves the way towards green energy, as in Denmark, where democratic local co-operatives own the majority of distribution grids, and Hamburg, Germany, where the people voted to buy back the city's grid. In Boulder, Colorado, a similar vote was cast, with the aim of setting up a publicly owned energy company to help the community meet their self-sufficiency goals and to break up the monopoly of their current distributor, Xcel. In Catalonia, students and staff of Girona University set up a public energy company to combat the monopoly held by Spain's two large energy companies and to provide renewable energy. Let's make public ownership so successful it can never be dismantled! We need a renewable, publicly owned, energy revolution!